We will no longer have our pot luck holiday dinner buffet at the December 12th meeting. However, coffee, soft drinks, and dessert will be available that evening. Bob Schuldenfrei suggested that members who would like to have dinner could meet at 5:00 PM at the Atlantis Grill, 5805 South Congress Avenue (at the intersection of Lantana and Congress), Atlantis 33462, telephone 641-3330. If you would like to have dinner at the Atlantis Grill at your own expense, please call the restaurant to make a reservation. Mention the Round Table group when you call. There will be a raffle at the December meeting. Any small gift cards for the raffle drawing would be greatly appreciated. Our speaker will be Robert Macomber, a great friend of the Round Table. Please pay your dues at the December meeting. There will be envelopes available to mail your dues at a later date. As is usual for our holiday meeting, we have Robert Macomber back with us again. His topic will be The Crucial Role of Key West in the Civil War. You will relive the island's transformation from pre-war backwater supply depot and site of liberated African slaves in 1860, to occupied enemy territory in 1861, to the most important Union outpost in the Gulf of Mexico in 1862. You will vividly experience a remarkable demonstration of American military honor in 1863, the horrific epidemic of 1864 and, finally, the terror of potentially the last great sea battle of the Civil War in 1865. This amazing story will change your view of the island forever! Peppy Lizza gave a presentation on haunted Civil War sites. He introduced his program by saying this is not your average Civil War talk. It was a little bit outside of the realm of history. He clarified that this was really history in a different form. In addition to the facts, you will hear some incredible stories. These are real stories that happen to real people, and I’m just here tonight to report that. He suggested that tonight we will go on a ghost tour. He asked people in the audience if they had ever been on a ghost tour. Many people said they had. With many ghost tours out there, it kinda makes you wonder. “What’s going on here?” Peppy said that he had personally never seen a ghost. He doesn’t think they appear to Italian people. It might be the high garlic content in our blood. However, there are many ghost tours, even here in Palm Beach. Additionally, he described hauntings at the Blue Anchor Inn, the Colony Hotel, and even a plane crash in the Everglades. Peppy is a retired letter carrier. He bought a home and discovered that there was a haunted cottage not far from where he lived. At one point during his career, he was handed a letter to be delivered to the supposedly haunted cottage. So, we went up to the place, went in, and talk to someone in there. He told me the story of this person’s mom. She was told it is not safe to stay there. She said no, no I’m fine. When other people went back to the house, they found the lady sitting on the curb. She explained that things move in there, all by themselves. Other stuff falls off the mantle. This was a little more than she could handle. Peppy Lizza travels to many Civil War sites. When he arrives at a new site, he would ask people if they have ever heard of a haunting. Not only the regular people, but most importantly he would ask the employees if they ever experienced the supernatural. He would ask, “has anything unusual happened to you?” Before he ventured into the stories of the evening, he explained that ghost stories are as old as literature itself. Washington Irving, Shakespeare, Charles Dickens, and Edgar Allan Poe all wrote about ghosts. Hollywood films have portrayed ghost stories. “What waits for us when we leave this mortal plain?” An attempt to explain what gives with all of these stories, Peppy zeroed in on unnatural death. Of course, war is full of unnatural death. In America, there was no greater source of unnatural death than the American Civil War. It was a very young country. There were over 620,000 killed in that conflict. That’s one out of every 50 Americans. The people, and the country, never recovered from that. The average age of a Civil War soldier was 25 years old. By and large, these were not professional soldiers. They were farmers or bankers or all types of normal civilians. Many of them, in the beginning, saw this is a great source of adventure and they didn’t want to miss it. Most of these people had never been far away from their homes. We are about to start our stories. I will begin each story with a quote. I would ask you to try and guess where we are going. Peppy’s first quote was a little different from what I have found on the Internet. This is what was found in the historical record: "The crimes of this guilty land can never be purged away but with blood." A member of the audience correctly identified the speaker as John Brown. This was the introduction to the story of Harpers Ferry. A large arsenal was there, and Brown, along with a ragtag group of raiders, wanted to seize arms that were stored there. He did this because he was an abolitionist and needed arms to foment a slave uprising. Back then, many of the people dislike slavery, but they were not abolitionists. Abolitionists wanted the immediate end to slavery. He came from Kansas along with his sons, and he wanted to free as many slaves as possible. Not only did want to free the slaves, but he wanted to arm them and terrorize the slaveowners. John Brown however, was not a very good military man. He did manage to capture a few slaveholders and hold them for hostage. One of the persons he captured was Lewis, Washington, a nephew of George Washington. One of the artifacts from this capture was a sword that George Washington was given by Frederick the Great. Brown took the sword, and as a symbolic gesture, gave it to a slave. At Harpers Ferry, he just showed up, got into a brief firefight, and was easily captured. 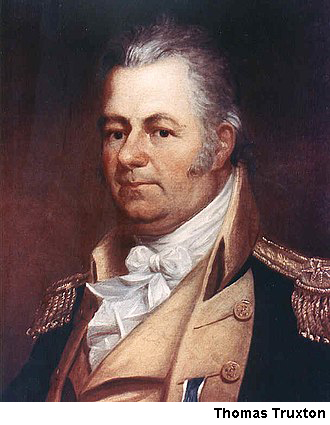 It is interesting to note that at Brown’s capture a United States officer was in command. This was none other than Robert E Lee. 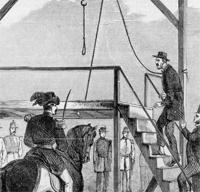 On December 2, 1859 he was hanged. In the summer of 1974 something very odd happened in Harpers Ferry. The Park Service saw this guy walking around, wearing old clothes, wearing a beard, and somebody remarked that the man looks very much like John Brown. This guy, who looks a lot like John Brown, has been seen by many visitors. A group of people from the South decided to take a picture of this man. So, this is where the story gets a little weird. The group returned to Mississippi and had their pictures developed. This man was in none of the pictures. Peppy wonders if this was a portal in time. It certainly is odd that the man showed up in none of the pictures. Peppy’s next quote was likewise imperfect. “What is this knocking at my door? Only the wind and nothing more.” Once again, the audience identified this correctly as Edgar Allan Poe. It was from the poem, The Raven. While there are plenty of references in the poem to noises, the word knocking does not appear. In the second line from the quote was: “’Tis the wind and nothing more!” This was a good lead-in to the story of haunted Baltimore. There are lots of places scattered around town that are claimed to be haunted, but the most haunted spot is somewhere out in the harbor. It is USS Constellation. Peppy noted that this is probably as close to the energizer bunny as you can get. The ship keeps going and going and going. The ship was built primarily to deal with the Barbary pirates. When we were a colony of Great Britain, the pirates did not bother a colonial entity. But after we won our independence, the pirates knew we were there. From that time forward, American shipping was victimized. President George Washington signed a bill authorizing the construction of six ships. Only three of them really got built. They were: Constitution, Constellation, and United States. Each shipyard designed the ships to their own specifications. Constitution and United States were gun heavy ships. Constellation was built for speed. The shipbuilder was a yard that built yachts. He wanted the boat to go fast. The nickname for Constellation was the Yankee racehorse. The first captain of Constellation was Thomas Truxtun. He was strict, he was a disciplinarian, and therefore a regular Navy guy. But he was a good captain. While he was only a captain for a short period of time, in that time they captured a lot of pirates. His action gave the American people a real sense of pride. He leaves the Constellation in 1801 and writes the Navy manual on tactics at sea. The ship went on to have a glorious career. In the 1820s, Constellation stood patrol for slave ships. This was done off the African coast. It was active in the Seminole Indian war. It cruised in all the major oceans of the world racking up about 58,000 miles. In 1853 the ship needed an overhaul. The overhaul was really a rebuild of the ship. The ship was made longer and had many new parts. But it also preserved many of the old parts from the original ship. So, by 1859, it was back in duty. It was active in the Civil War by looking out for blockade runners. It was also used as a training ship. At this time in history, steam and ironclad ships began to change the nature of warfare at sea. However, this ship was so special that it got special use. Besides being a training ship, it transported foodstuffs to Ireland during the famine. It was still afloat at the end of World War II. However, the ship needed major repairs. The citizens of Baltimore wanted to restore the ship. They had a series of fundraisers to collect money necessary for the repairs. 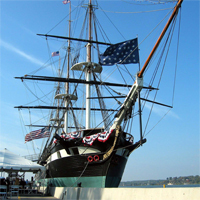 After the ship was formally decommissioned in 1955, she was moved to the harbor in Baltimore. A funny thing began happening, starting in 1968. Ghostly sightings were spotted on the decks and below. One night someone saw a figure dressed in an old uniform on the ship so they called the police. The police showed up and is customary they bought their police dogs. As they got close the police dogs stopped, the hair stood up on their backs, and they refused to get on the ship. Something was on that ship that prevented the dogs from doing their job. Right next to Constellation was USS Pike, a retired submarine. Even these guys saw strange figures on Constellation. A strange consistency involved these stories. They all happened around midnight. These apparitions walk or float on the ship decks amid the smell of gunpowder. A number of these spirits have been identified. The first one was Neil Harvey. Neil Harvey was on the original ship in 1799. He was accused of leaving his post and being a coward. He was executed by Capt. Thomas Truxtun. First, one of the sailors ran his saber through him and then he was mounted on the front of a cannon and literally blown away. You might understand that if he was innocent, his spirit might be a little upset. Another one of the apparitions was Capt. Thomas Truxtun himself. He is seen in his uniform and he appears consistently on the forecastle deck. One of the sailors on Pike took a picture of him, which appears as a bluish white radiance. Another ghost seems to be an 11-year-old boy who appears on the deck. This boy was killed in 1822 by a couple of sailors. He was the ship’s surgeon’s assistant. The story was revealed that the boy was killed with a knife. The author of this story was a local psychic. And finally, we have Carl Hansen. Now Carl was from the 20th century. He was a watchman on Constellation. Anyone who knew him knew that he loved the ship. And somehow or other, he’s back. There’s one more story about a priest who was standing around waiting for a tour. When the people who are running the tours came back to the priest, they said to him, “ready for your tour?” The priest said that wasn’t necessary as “the old guy showed me around.” There was nobody else on the ship. The only explanation was Carl Hansen must’ve given him the tour. These transcriptions take a great deal of time to get down on paper, so I’m going to jump right to the Gettysburg story. The quote from this story is: “these dead shall not have died in vain—that this nation, under God, shall have a new birth of freedom, and that government of the people, by the people, for the people, shall not perish from the earth." Everybody in the audience knew this one. Peppy explained that Gettysburg is the most significant battle in this hemisphere. The battle here, once again, was an accident. Robert E Lee was trying his second invasion of the North. He used South Mountain as his cover. He’s heading for Harrisburg to drum up some support from the people of Western Maryland. His objective was to end the war. The people were ready for this war to end. It was the politicians who didn’t wanted to end. Peppy retold the story of Harry Heath asking AP Hill if he could go into Gettysburg to look for some shoes. Peppy acknowledge that this story has been debated and may or may not be true. Because Harry Heath wrote the shoes story in his memoirs Peppy is going to run with it. So, he starts for town and instead of shoes he finds Yankees. Neither army was set up to fight at this time. They just ran into each other. Gen. Lee has ordered his generals not to engage the enemy until the Army is brought up. Gen. Lee asks Heath “didn’t you understand my orders?” Peppy describes the scene as illustrated in the movie Gettysburg. In the movie Heath reply was “my boys just got their dander up.” The rebels succeeded in taking the town, after meeting up with Buford and his cavalry. Gen. John Reynolds brought up his unit, the Iron Brigade. While the rebels won the town, unfortunately for them, they push the union back up on Cemetery Ridge. Anchored by Culp’s Hill, this was a much better defensive position. It is certain that Lee did not want them to do that. The presentation continued, describing all three days of the battle. The common objective of all three days was to move or destroy the Union line. The third day was marked by a two-hour cannonade attack, an attempt at encirclement by cavalry, and the well-known frontal assault, Pickett’s charge. As you all know, this did not go well for the South. Thus, began a long retreat. There is actual documentation saying a Confederate band playing Lowell Mason's hymn Nearer My God to Thee. The retreating force formed a 17-mile-long wagon train. Gen. John Imboden was the cavalry for Lee’s rearguard. With all the death, this venue was ripe for ghost stories. 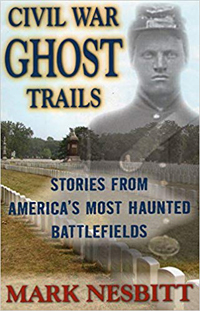 A park ranger, Mark Nesbitt, has written a series of books about the ghosts of Gettysburg. 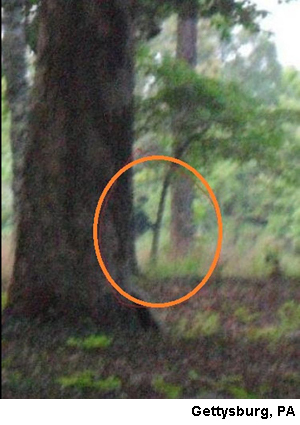 According to him, many of the sightings were actually noted by park rangers. So, the park rangers are really the best source for this information. There are many ghost tours in Gettysburg itself. Nesbitt retells that at Gettysburg College, which used to be called Pennsylvania College, late at night, two college administrators were riding the elevator to the first floor. The elevator did not stop at the first floor but continued down to the basement. The door opens up and there a lot of old boxes there. There was a horrible scene. Men with arms sawed off, soldiers in agony, people calling out, when one of the sergeants did this to them. At this point, Peppy illustrates sawing off a limb. The two administrators push the button wildly, and finally the door closes and goes to the first floor. The administrators report this scene to security. “Oh my God, what have we seen?” Security went down the next day, but all they saw was a series of boxes. Now, realistically, this could have been some kind of college prank. Peppy suggests that it was a scene out of history that they saw when the doors opened. This is just one of Nesbitt stories. He has written four books on this topic. Another one of Nesbitt’s stories concerns John Reynolds, which was already mentioned. He was a rising star in the Union Army. He graduated from West Point. He was an instructor at West Point. He was a veteran of many campaigns, including the Peninsula where he was captured. A little later on he was exchanged. When he was exchanged, they gave him a promotion. He was given the First Corps, the Iron Brigade. 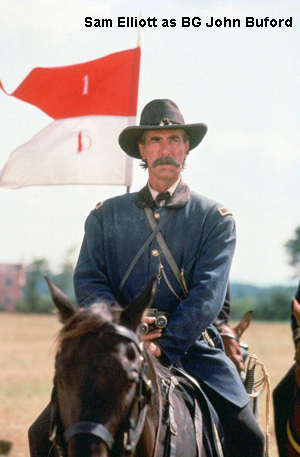 The movie, Gettysburg, was quite accurate in the portrayal of John Reynolds riding up and meeting John Buford. Reynolds asked, “can you hold?” Buford replies, “there will be the devil to pay.” As Reynolds is putting his troops in defensive positions, he is killed by a Confederate sharpshooter. Of the 120 generals that were on the field at Gettysburg, nine were killed. Four were on the Union side, one of them was Reynolds. He was from Lancaster, Pennsylvania. His body was placed in a coffin and left on Steinwehr Avenue, the main street in town. They are waiting to send the body back to Lancaster. So here we are, back in our time, and people are walking around Steinwehr Avenue. It’s late at night and people are looking in an old photographic store and they see a man in a coffin, with a lady dressed in black standing over him. It is very odd in this time period, to see something like that. Next day they come back to see the dead man in the store. Oh no, there’s no dead man here. Oh yes, there was a door here last night, just behind that pegboard. This kinda shocked the people who worked in the store because they didn’t know about that. Peppy muses that, rather than ghosts, it is another time that is intersecting with us. The last story on the record is about the Cashtown Inn. The Cashtown Inn was built in 1797. It didn’t open as an inn until 1815. The reason is called the Cashtown Inn is because the first owner, Peter Marck, only accepted cash in his establishment. Other places allowed you to work it off or barter for your room, but not Peter Marck. It was strictly cash. When the stagecoach drivers were coming up to the inn, they would yell to the passengers to make sure they had cash. So that’s how the town was named. There’s a famous illustrator named Dale Gallon. One of his nice works of art shows AP Hill in front of the Cashtown Inn. The scene has been reproduced in the movie Gettysburg. In the movie it shows our old friend Patrick Falci as AP Hill. During the Civil War, the innkeeper at the time claimed that Robert E Lee was no more than 20 feet from my bar. 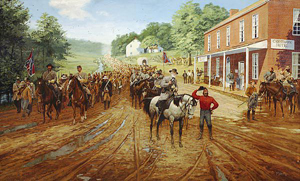 The road going through Cashtown was Lee’s most valuable supply line. The town was the headquarters of AP Hill. Now, Gen. Hill suffered from a multitude of ailments at this time. When he saw this place, he made up his mind that this is where he wanted to stay. It’s got all the things that makes up a good headquarters. It’s got a spring, two big ovens, plenty of rooms, and everything you need to support a commercial bakery. That is what he did. They turned out bread for his entire army. And the hierarchy of the Confederacy actually stayed there. Peppy has a book about the haunted Cashtown Inn. The book was written in the 1990s by the owners of the inn at that time. These people bought the inn before they knew the inn was haunted. However, they soon found out. Once they discovered this fact, they decided to feature it. In each room of the inn there is a journal. There are instructions that if you see anything unusual you are to write it up in the journal. Peppy proceeded to read some of these journal entries. I’m only going to reproduce one here, so that you can get a flavor of this haunted place. The innkeeper, Mrs. Hoover, confronted the ghosts and said, “I don’t know how many of you are here, but can we make a deal? I will not bother you if you don’t bother me.” She also related the story about how the chef heard the crashing of china in the kitchen. Certain that all the plates had fallen on the floor, they rushed into the kitchen to find that nothing was out of place. These are the kind of things that happened at the Cashtown Inn and they are still happening today.